It is 2018. England has been struggling under a recession that has shown no sign of abating. Years of cuts has devastated Britain: banks are going under, businesses closing, prices soaring, unemployment rising, prisons overflowing. The authorities cannot cope. And the population has maxed out. The police are snowed under. Something has to give. Drastic measures need taking. The solution: forced sterilisation of all school leavers without secure further education plans or guaranteed employment. The country is aghast. Families are distraught, teenagers are in revolt, but the politicians are unshakeable: The population explosion must be curbed. No more free housing for single parents, no more child benefit, no more free school meals, no more children in need. Less means more. But it is all so blatantly unfair - the Teen Haves will procreate, the Teen Havenots won't. I received a free copy of Riot from NetGalley in exchange for an honest review. Beware; if the introduction of Riot doesn’t scare you off and you get through it, a unique story awaits you. Riot is an action roller-coaster which definitely didn’t disappoint me, despite its rating on goodreads, which discouraged me for just a moment. But, I sat down and read it over a pretty short time span. In chapter one the reader finds himself in the middle of a massive protest where the protagonist, Tia Thomson AKA EVE, The Mother of the Future, is participating with her friend. The riot gets out of control and the action kicks off. The storyline had me on the edge of my seat, figuratively speaking, at a lot of times. The topic of Riot is one, which scarily enough sounds like something which might just be likely to happen one day, considering the way todays governments are handling things. A new Bill is on the verge of being accepted which would force those without a “good future” to get the Snip which would stop them from being able to become parents one day. Tia and many others are trying to stop this Bill from happening. The plotline is as plausible as can be considering the short amount of time over which the story unfolds and the fact that Riot is a standalone novel, which means that there are no sequels during which the whole story could unfold. The characters are likable and interesting. Tia is a ‘rebel’ which still has not lost the fear of consequences and, as I’ve seen many people say, she may or may not be a “spoiled brat” who still has a sense of what is right and wrong. She knows how much her father has wronged her mother and knows that he wouldn’t stop at nothing to get what he wants. I liked her. And Cobain make me both like and doubt him. As we encounter him the first time I had my doubts as to what he really planned as he helped Tia but I soon came to the conclusion that I like him. I really liked the writing style of Sarah Mussi, though there were a few places where Tia’s thinking and evaluating was dragged out a bit too much for me, but that’s all right. I think Mussi has created a very intriguing and unique story in Riot which I am very happy that I read. The initial reason why I decided to apply for reading Riot was the cover which I love. It immediately caught my eye and made me curious, which as we all know is the purpose, oftentimes, of a cover. 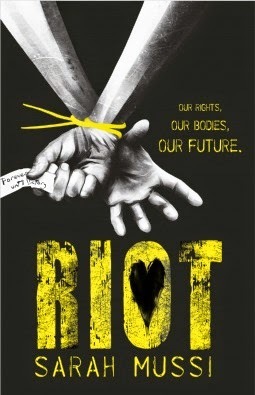 All in all I can honestly say that I enjoyed reading Riot a lot and was intrigued by the story. I can recommend it to anyone who likes action packed stories without the typical cheese love story woven into it. I give Riot by Sarah Mussi 5 out of 5 stars. I'm on YouTube now, too!